Just some rain here nothing too serious. And I think the storm event is done now. A joke for Bris, but not unexpected. 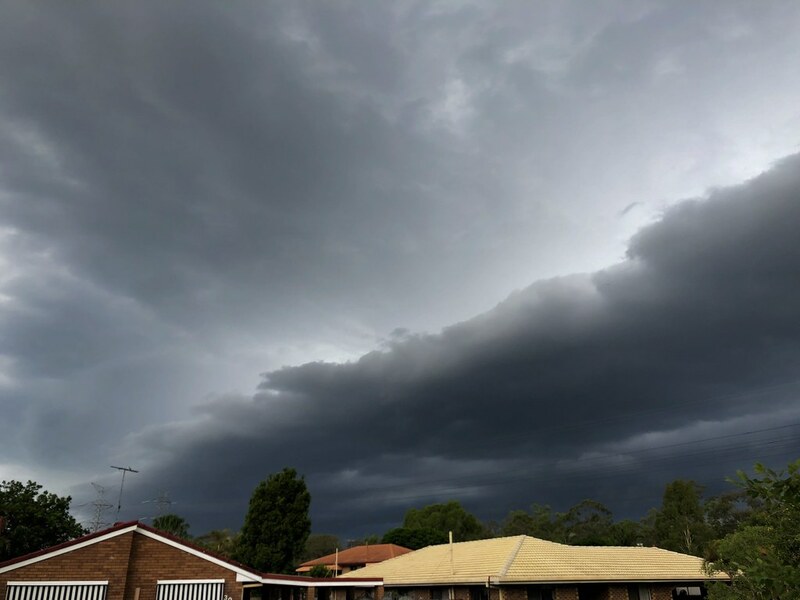 View from my place on the Southside earlier as a shelf cloud rapidly developed under secondary activity along the leading edge of the change (helped by the outflow boundary of the stronger cell on the GC). Also just drove through absolutely torrential rain near Beenleigh with some marble size hail and lightning hitting everywhere nearby. Grouse bit of Sky there Ken. Been some interesting forms about the last few days ! A gust of 98kmh at Cape Moreton at 1750. Rainfall totals over 50mm around Murwillumbah and over 25mm across the broader Tweed river basin on the radar since 9am accumulated rain. I'm still buzzing after this afternoon.Without a doubt that was the most fierce thunderstorm I have ever experienced.It must have been local because there hasn't been much nes about it apart from FB.Lucky it didn't unleash itself in a major town.Couldnt believe the amount of trees down and snapped in half in such a short span of time. Nada, niente, nichts here so far but 2 hours of good solid thunder with a couple of CGs. A bit of cloud and a puff of wind here and that was it. Nice drop in temperatures through. No rain here in Ferny Grove but a beautiful cool change. Temp from 36 to 24 in about 40 minutes. Some good gusts as well. I'm pretty relieved we didn't get those monsters further south. Round 2 here, lots of rumbling but no wind and only mild rain. Up in Cedar Pocket a mate had a good fall of hail in the earlier storm, and unfortunately had his car windscreen smashed by a falling branch. Today panned out better than I expected for this area. I thought the cap would be far too strong and would hold things off till tonight...how wrong was I on that assumption. Nothing severe though, just 29mm all up, the airport scored better than us for once too. Pretty clear also that the drier air in the lower levels came into play over the eastern Darling Downs and Brisbane Valley early this afternoon. You could see it was trying all afternoon but nothing was really able to get going apart from right along the coast near the SE change. Not totally unexpected though. The last of the storm activity about the local area cleared off around 2:00am this morning as a stray but decent storm (enough for BOM to reissue the STW) moved through toward Macksville and then offshore passing about 10kms to the north of here. The southerly moved through here around 10am this morning. 13 thunderstorm hits and 207.8mm here since December 13th, with some of those storms that hit being severe and very lightning active too. Cheers for the vid Plumb. Mother Nature supplying some free ice cubes just before Christmas I see. Just jumped up to 70mm for the day thanks to a thundery band of rain associated with the SE change. Airport wasn't so lucky with this lot though as it was all on the southern side of town and to our south. PAST 24 WEATHER SUMMARY... Passage of trough 1648, no associated weather locally. Event total 5.6mm all on Friday, no rain or storm Saturday. What is reportable is the transition from sweltering in front of the aircon yesterday arvo to putting on a jumper this morning!! !